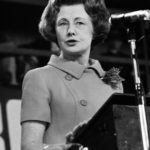 Barbara Castle was a British Labour Party politician who was the Member of Parliament for Blackburn from 1945 to 1979, making her the longest-serving female MP in the history of the House of Commons, until that record was broken in 2007 by Gwyneth Dunwoody. She later became the Member of the European Parliament for Greater Manchester from 1979 to 1989. One of the most significant Labour Party politicians of the 20th century, she served in the Cabinet under Prime Minister Harold Wilson in a number of roles, including as Secretary of State for Employment, Secretary of State for Health and Social Services, and First Secretary of State. "He described how, as a boy of 14, his dad had been down the mining pit, his uncle had been down the pit, his brother had been down the pit, and of course he would go down the pit." "Those were the ideals that drove us to nationalization of the health service."